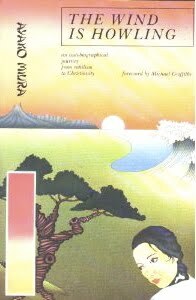 The first book by Miura Ayako that I ever read in English translation was The Wind is Howling (InterVarsity Press, 1977), an abridged translation of Michi ariki, the first in Miura's autobiographical trilogy that includes Michi ariki, Kono tsuchi no utsuwa o mo, and Hikari aru uchi ni. I had been reading Miura's works in the original Japanese for some time by then, and was nurturing my own dream of becoming a professional translator. Totally impressed by the smooth and authentic readability of The Wind is Howling, I immediately became curious about the translator, Valerie Griffiths. But it wasn't until recently (over thirty years later!) that I made an effort to contact her, and even in the age of the internet, this wasn't easy. Finally, one of my email queries reached her, and I was honored to receive a reply from Valerie herself! What a thrill this was! My husband and I served in Japan with OMF from 1958-1967 when OMF asked us to move to our international HQ in Singapore. [...] While in Singapore we began to hear about Mrs. Miura and when I started a small lending library of Japanese books I included hers. I had never achieved the 1800 kanji for reading. When a Japanese child was dying I lent some books to his parents who were spending all their time at the hospital. His father got engrossed in Michi ariki and began relaying the story to me. I felt it was much more effective to translate a book like that than to write English books about Japan so I started translating in my spare time. Valerie went on to say how the limitations of her Japanese reading ability made the task time-consuming and arduous. But with the help of a friend who offered to write reading clues next to the harder kanji, she managed to complete the translation. That was the only Miura book she ever translated, and she says she could never do it again. But I --along with many other Miura fans-- will always be thankful that she did this wonderful work. The Wind is Howling is out-of-print, but can sometimes be found for sale through online used book shops. Keep searching, and you may uncover this treasure yet.